In earlier times it was easier to control a million people than physically to kill a million people. Today it is infinitely easier to kill a million people then to control a million people. – Zbigniew Brzezinski (Council on Foreign Relations, Trilateral Commission, Bilderberg Group, Carter/Obama Advisor). The cancer epidemic is a soft-kill operation and a move by the world’s so-called elites to cull the human population. It is well documented that the Club of Rome, Bill Gates, Ted Turner, the Rockefellers, Warren Buffet and many other globalists plan to dominate and decimate humanity with their population reduction agenda. As we will see, the globalists first cause the cancer and then provide us with their ineffective treatments (not cures) for profit. This method is known as Problem – Reaction – Solution. According to the American Cancer Society, 1,638,910 new cancer cases will arise in the United States during 2012. Approximately 577,190 American cancer patients are expected to die from their cancer this year as well. One in every two men will suffer from cancer (one in four will die) as will one in every three women (one in five will die). According to the Centers for Disease Control and Prevention, cancer is the second leading cause of death, closely trailing heart disease. In 1971, President Nixon and Congress declared war on cancer. Since then, the federal government has spent well over $105 billion to battle cancer. In 2010 alone, the National Cancer Institute had a budget of $6.4 billion. As of March 2011, the Susan B. Komen Foundation, allegedly leading the fight against breast cancer, had $439,451,449 in “total public support and revenue.” Pharmaceutical giant Merck alone had a 2010 research and development budget of 8.12 billion. Why all the death and suffering despite billions, if not trillions, in government and private cancer research? Why have cancer treatments remained almost unchanged since the 1950s: toxic radiation, toxic chemotherapy, and surgery? The answer is simple: treating cancer is profitable; curing it is not. Cancer also furthers the globalist goal of massive depopulation. Among the many ironies of our modern world is that Gerald Ford awarded the Presidential Medal of Freedom-America,s highest civilian honor-to Defense Secretary Donald Rumsfeld on January 19, 1977. Just a few weeks later on March 8, Rumsfeld became the CEO of G.D. Searle to take point on a mission to force the Food and Drug Administration to approve for human consumption a known carcinogen and neurotoxic poison. Mission accomplished: Today some 9,000 commonly consumed products are laced with this weapon of mass misery and millions of people live with chronic illnesses linked to the artificial sweetener aspartame. It is our belief at The Idaho Observer that if some guy named Parkinson can have a disease named after him, then Donald Rumsfeld ought to have his own disease, too. Hence the term Rumsfeld disease A. It seems that while obesity rates have risen over the decades, so have portion sizes – not a particularly surprising connection. In fact, an incredibly alarming infographic helps to show that not only have meal sizes increased in size over the decades, but restaurant portion sizes have quadrupled since the 1950′s. Could this be the reason for the ballooning obesity epidemic? 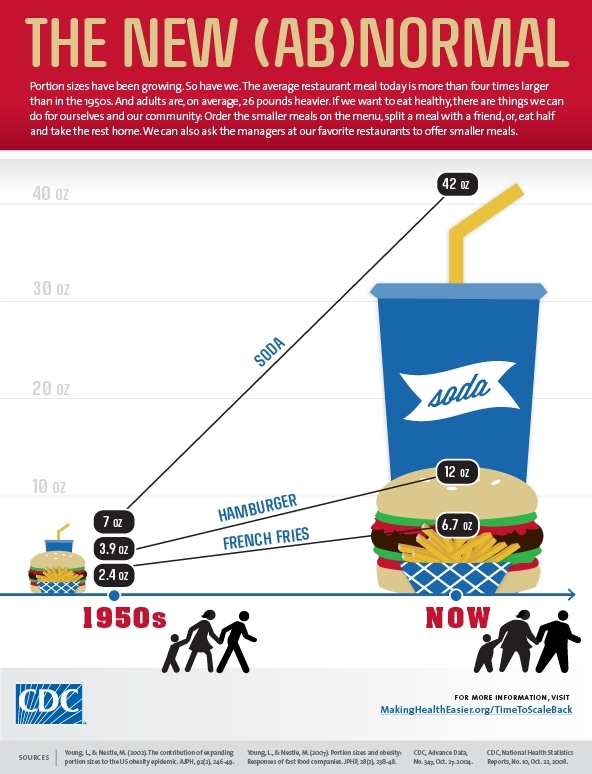 The infographic created by the Center for Disease Control and Prevention shows that hamburgers and french fry meals have tripled in size over the decades, while a cup of fountain soda is a whopping 6 times larger today than it used to be. A 2.4oz portion of french fries has grown to 6.7oz; hamburgers from 3.9oz to 12oz; and soda from 7oz to 42oz. What may be even worse is that accompanied by this massive increase in portion sizes is the heavy use of harmful and toxic ingredients. While the ingredients used in food used to be minimal, you can find a plethora of toxic substances in the majority of food today, including MSG, aspartame, high-fructose corn syrup, artificial coloring, neotame, caramel coloring, and much more. McDonald’s chicken McNuggets, which would be expected to have nearly 0 ingredients, contains autolyzed yeast extract, dimethylpolysiloxane, sodium phosphate, to name a few ingredients. Even something as simple as ‘strawberry flavor‘ consists of nearly 50 different chemicals. These ingredients along with many more can be found throughout the mainstream food supply. Given the continuous downfall of the average American diet over the decades, it is no surprise to see obesity rates (and subsequently every other illness and disease) skyrocket in recent years. Unfortunately, Americans have some of the worst diets in the world, and everyone knows it! With portion sizes increasing, toxic ingredients making their way into the food supply, and Americans continuing to consume this food, it is estimated that 50% of the population will be obese by 2030, lurking around the 60% nation-wide obesity rates in 2010. Are Americans consuming too many calories? Unfortunately, yes. What’s more, the massive increase isn’t only leading individuals to experience health problems, but work productivity suffers as well. Obese individuals take more sick days and are less productive than health-weight individuals, with the most obese people taking 5-9 more sick days a year. Not only are hospitals, buses, and airplanes making adjustments to accommodate for large individuals, but employers are also paying the price as well. In many cases this loss is in the form of thousands of 10′s of thousands of dollars each year. Actually, the cost of obesity in this regard is thought to be nearly $73.1 billion annually. The good news is that with a little calorie management, exercise, and organic living, obesity rates can easily begin to spiral downward. What will be the end of Monsanto? Could it be lawsuits, new legislation, or perhaps even a tiny insect that is less than 0.10 mm in length. A new report reveals that rootworms may ultimately be what ends Monsanto’s crops, despite the biotech giant’s rampant success within the United States legislative system. Amazingly, western corn rootworms have virtually no problem gobbling up Monsanto’s modified maize crop, as they have developed a serious resistance to the very crops designed to kill them. So much so that these little critters are outpacing Monsanto’s top scientists. To make matters worse for the company, the resistant rootworms are maturing earlier than expected this year. And with the enhanced growth has come enhanced birth rates, with the bug’s larvae hatching the earliest in decades. Monsanto, of course, is absolutely defenseless against the resistant rootworms which have adapted to their biopesticide known as Bt. At least 8 populations of insects have developed resistance, with 2 populations resistant to Bt sprays and at least 6 species resistant to Bt crops as a whole. The answer? Use even more intelligence-crushing pesticides. “Monsanto’s program for monitoring suspected cases of resistance is ‘inadequate’”. The statements have been reinforced by another group of concerned scientists. A body of 22 academic corn experts voiced serious concerns over GMO crop failures back in March, warning that a collapse of the GMO corn industry may soon follow — a particularly mighty prediction when considering that 94 percent of the US supply is currently of the genetically modified variety. It is also important to consider that much of the corn is not used for food, but for biodiesel purposes. Will nature adapt to Monsanto’s genetically modified creations and lead to their downfall in the end? Time and time again researchers and agricultural professionals have been calling upon Monsanto and the United States government to return to traditional and sustainable farming practices — even citing the fact that Monsanto’s GMOs produce even less yield. Instead, the modified crops have overtaken much of the food supply. Now, in the face of collapse, the only answer provided by Monsanto is to drench crops in even more pesticides and modify their genetic coding to an even greater degree. Monsanto’s been at the forefront of much controversy, and for very good reason. Their history shows heinous applications of their technologies, which greatly affect people’s health. Monsanto was even voted the worst company of 2011. Another point to keep in mind is that Monsanto’s nefarious & signature herbicide Round-Up causes birth defects. The Monsanto corporation makes their money by producing man-made crops, but the company behind some controversial GMOs isn’t spared from scandals. RT’s Abby Martin discusses with Liz Wahl Monsanto’s sordid past and their often untold history with America’s agriculture business. [NaturalNews] What does the term “natural flavors” really mean? Could it be that the term “natural flavors” includes genetically modified, pesticide-laden food? There are also plenty of “food products” on the shelves that read “all natural” on the label, but they still contain large amounts of synthetic, laboratory-concocted food agents, many of which cause diseases and disorders. So how much more confusing can it get to simply shop for food that doesn’t kill you slowly? Exactly who makes the rules about terms put on labels? You better hope it doesn’t all fall in the hands of the FDA, the same organization responsible for allowing genetically modified food to exist and be sold completely undercover ever since its inception. And does natural flavoring include the migraine headache monster monosodium glutamate? Also, can “natural flavoring” include bugs that are ground up to turn your food into some “happy” colors that help you celebrate some birthday or big event? One final question: could “natural flavoring” mean the food contains meat, even though it’s a vegetarian or vegan product? Do you know what autolyzed yeast extract really is? It’s MSG. Do you know what hydrolyzed soy protein (also MSG) does to your body? Have you thought about eating some beetles lately, or do you only do that when you have cupcakes, popsicles, birthday cake and cough medicine? Has your doctor discussed with you the fact that your ingestion of artificial sweeteners may be the main cause of your muscle aches, headaches, irritable bowels and even fibromyalgia? Do allopathic doctors, surgeons and oncologists in America have to take even one single class in college on nutrition? No, they don’t. What about continuing education to keep up with the latest food toxins? Nope! Who regulates whether or not something qualifies as a “natural flavor?” Who does inspections at factories and laboratories, or is that left up to the manufacturer, much like the way it’s up to vaccine manufacturers to report adverse effects? When the police themselves are crooks, there’s no “policing” of the crimes they are committing. In fact, the whole differentiation of GMO & artificial from Natural & Organic has become a murky mess. The line of distinction between foods labeled “all natural” and cancer causing food is not only blurred, it barely exists. First of all, regulations for the word “natural” only apply to flavors; anywhere else you find it on food packaging means absolutely nothing regarding quality. Secondly, the FDA definition of “natural flavors” and “natural flavoring” allows for the substance to be extracted from plant or animal “matter.” So when you buy something that’sorganic, vegetarian, or vegan, and it has “natural flavoring,” you could be eating a pig, cow, turkey, chicken, or lamb which was shot up with growth hormones, fed GMO pesticide-laden corn and grain – probably mixed with other animals of it’s same breed, then shot up with antibiotics due to infections and diseases from living in confined quarters on slats covered in feces. Gary Reineccius, a professor in the Department of Food Science & Nutrition at the University of Minnesota has a tricky explanation for all you researchers. He convinces you to think more about the practical difference between “natural flavoring” and artificial flavoring, which is an angle that might make you think he’s looking out for your best interest, but then he contends that the “flavorist” creating any artificial flavoring could never achieve the same “desired flavor,” and therefore, if a consumer “purchases an apple beverage that contains an artificial flavor, he/she will ingest the same primary chemicals that he/she would take in if he/she had chosen a naturally flavored apple beverage. What a complete farce! Of course, this makes no sense at all, but it’s one of those resources out there to throw consumers off track who have the energy and the “gumption” to look up the difference online. Mr. Reineccius, the illustrious professor, goes on to tell you more lies. Next he informs you that, “Artificial flavorings are simpler in composition and potentially safer because only safety-tested components are utilized.” Really, so where are all the great results from the GMO tests they’ve run on humans? Monosodium Glutamate is a neurotoxin that can be legally hidden from you and/or be labeled “natural flavors” in the ingredients list. MSG is not a natural flavor – in fact, it can cause brain lesions, neuro-endocrine disorders, and neurodegenerative disease in humans, but you won’t hear any doctors of Western Medicine mentioning that at your next extreme migraine emergency visit. There are more than 25 names for MSG, so sometimes you find it spread out a little, just in case the manufacturer gets “checked out” by anyone other than the FDA. Not only is MSG scientifically proven to cause obesity, it is an addictive substance. Since its introduction into the American food supply 50 years ago, MSG has been added in larger and larger doses to processed meals, soups, chips, and fast foods. The FDA has set no limits on how much of it can be added to food.